No such thing as professional? Yahoo’s CEO Marissa Meyer made a stupid remark yesterday whilst announcing a complete overhaul of their Flickr photo-sharing website service. She actually said was that “…there’s really no such thing as professional photographers anymore”. Like many people who used to think that they were professional photographers I became very angry. What I’d love to happen next is to get commissioned to shoot her portrait for a major newspaper or magazine and to prove her wrong. That’s unlikely to happen, which is a shame. Within a few hours of hearing what she had said I had deleted my Flickr account and let my Twitter followers know that I had done it and why I had done it. Did Ms Meyer really mean to upset hundreds of thousands of hard-working professionals? Does she really think that our profession has ceased to exist? I suspect that what actually happened is that she made her remark with the subtlest of hints of humour in her voice in order to promote her company’s new-look product. I doubt that it has done too much harm but why do corporates continually keep doing this kind of thing? Gerald Ratner famously compared his company’s gold jewellery to a prawn sandwich wiping millions of pounds off of its share value and ultimately leading to his downfall. Time after time people at the top who believe their own hype and who think that they can be funny in order to sell their products make this same mistake. My business model isn’t based on Flickr. I had about thirty folio images up there simply because it probably pays to have a presence on all of the social media sites. I have probably shot myself in the foot by deleting my account but anger leads to gesture and the biggest gesture that I could make was to leave Flickr. The point that I really want to make here is that photography does have value. Good photography is, in fact, invaluable. Maybe if the Board of Yahoo realised that they’d actually get their CEO to apologise. It’s the first I’ve heard about her remark. As what she says is patently untrue, why be upset about what she says? I would be upset if someone told me a home truth that I found difficult to accept. But if I was secure in my skills and knew they existed as real skills, I would ignore the rest. With respect to you and your obvious skills, I suggest you really don’t need to get upset about Marisa Meyer. I appreciate you might be concerned that some potential customers might take her words with less than a grain of salt – but what goes around comes around, and they will see the results of hiring someone who cannot deliver. And I suspect Marisa Meyer has a bigger problem in living with the fact that she has just paid $1.1Bn for a micro-blogging site. I guess that I didn’t articulate the bigger worry which is that she has influence and she has implied that photography has a lot less value than it once did. 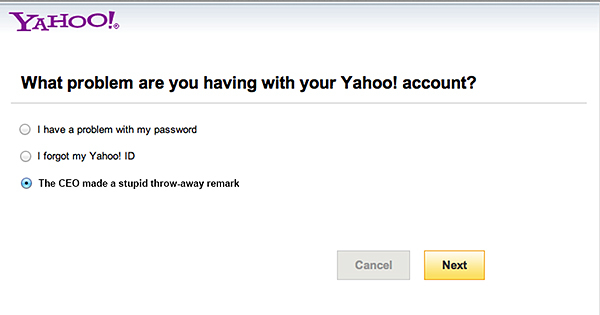 I just hope that Yahoo apologise rather than ‘explain’. Did you see this where she says it was a misstatement on her part and out of context? I love the word ‘misstatement’ – So obvious.